Voracious readers of the late David Foster Wallace, an author of massively ambitious fiction and casually revealing nonfiction, could be forgiven for regarding a movie about his life with some skepticism. How, after all, could one normal-sized film hope to capture the spirit and legacy of a writer who many came to regard as a voice of his generation? Wouldn’t any attempt to get into his famously bandana-wrapped head feel insufficient, at least compared to the sheer volume of work Wallace himself produced on the subject? But that’s the gentle genius of The End Of The Tour, James Ponsoldt’s witty and poignant new gabfest. Not only does the film productively narrow its time frame, dramatizing just five days in the life of the revered wordsmith, it also unfolds from an outside perspective—that of the reporter who accompanied Wallace on the final leg of the Infinite Jest book tour. The result is less portrait of an artist than snapshot of a brief, meaningful encounter, shared between two men enjoying different stages of professional success. That one of these men happens to be a modern literary hero is almost, if not quite, incidental. For a few minutes, The End Of The Tour seems in danger of teetering into the exact biopic pitfalls it ultimately avoids. Using Wallace’s 2008 suicide as a slightly hagiographic framing device, the film quickly flashes back a dozen years, when Rolling Stone staffer David Lipsky (Jesse Eisenberg) first tore though 1,000 or so pages of Infinite Jest. “There hasn’t been a writer like this,” Lipsky excitedly tells his editor, talking his way into a road-trip profile piece for the magazine. So off he heads for the snowy Midwest suburbia of Bloomington, Illinois, intent on securing a cover story with a rock-star novelist. It’s here that the movie leaps to life, with the introduction of one David Foster Wallace, played by a beefed up, dressed down, and brilliantly cast-against-type Jason Segel. Over the five days that followed, Lipsky and Wallace would travel by plane and car to the Twin Cities and back, eating junk food, guzzling soda, and smoking cigarettes. Mostly what they did was talk, on subjects ranging from addiction to loneliness to the awesomeness of Die Hard. The article would never be published, but Lipsky kept the tapes of their conversations, eventually using them as the basis for his memoir about the experience, Although Of Course You End Up Becoming Yourself. With The End Of The Tour, playwright Donald Margulies gives the material new dramatic shape, turning the “interview”—a multi-day discussion that ebbed and flowed with the insecurities of its participants—into a riveting two-hander. We watch as the writers size each other up, let down their defenses, and quietly fall into what might have been a friendship under different circumstances. The dynamic between them shifts constantly. Wallace—as played by Segel, reciting the words his “character” really spoke—is at once forthright and evasive, amiable and defensive, fiercely intelligent and proudly “ordinary.” Overwhelmed by his overnight success, and never entirely comfortable with the interview process, he provides engaging answers, while also dodging the tougher questions Lipsky asks. Hints of the deep depression the author grappled with throughout his adult life manifest themselves, especially as he comes to terms with what his companion is hoping to get out of their time together. Meanwhile, Lipsky, a novelist himself, struggles to overcome his envy and hero worship enough to do his job. (To some extent, the film plays like a literary cousin to Almost Famous, demonstrating the journalistic perils of getting too close to your interview subjects.) An edge of competitiveness complicates their real-life buddy comedy, as Wallace realizes he can’t entirely trust the man with the tape recorder and Lipsky begins to resent what he sees as the false modesty of the creative genius whose success he covets. By now, Eisenberg has mastered a full spectrum of neurotics, from the adorkable nice guys to the petty geek tyrants. There’s a little bit of both in his portrayal of Lipsky, a man torn between competing impulses—his genuine, growing affection for Wallace versus his mercenary professional instincts, and his admiration of the author’s gifts versus his obvious jealousy of them. It’s one of his fullest, most complicated performances. But the real revelation here is Segel. The actor hasn’t just disappeared into his role physically, offering a decent facsimile of how Wallace looked, talked, and gestured, at least in interviews. He’s also deepened some shade of blue that’s always been there in his work, the melancholy he dressed in comic drag for Forgetting Sarah Marshall or mostly buried after that single superb season of Freaks And Geeks. You really forget you’re watching Jason Segel. He simply becomes someone else. Expanding upon the intimacy of his charming teen melodrama The Spectacular Now, director James Ponsoldt nourishes his long, languid dialogue scenes, like a late-night discussion on the accessible sexiness of Alanis Morissette. 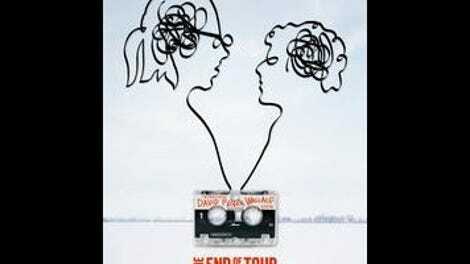 There’s a Linklater-like confidence to his filmmaking; though supporting characters drift into the orbit of these uneasy travel mates, The End Of The Tour largely remains a two-man show, expertly approximating the vagaries of actual conversation—the starts and stops that occur when two strangers are getting to know each other, one sentence at a time. But will the cult of DFW love the film? It may be too straight, too simple, too sentimental for some Jest junkies, though it’s hard to imagine how a Wallace fan could be unmoved by scenes of Segel reciting the writer’s articulated, transcribed anxieties. Either way, the movie’s insights—into professional envy, into fear of fraudulence, into the strange business of forging a friendship—extend beyond the boundaries of its biographical roots. Which is to say, one needn’t have read a word of Wallace’s work to relate to the sometimes embarrassingly human experience immortalized here.